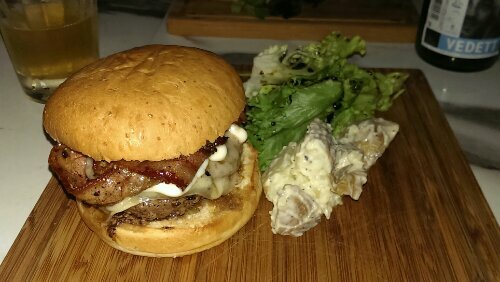 @Duxton | Get Your Grub On! A proper ending to a Mexican day. Telling good friends about my Mexican lunch planted the idea of tacos into their brains that they had to have ’em before leaving for their U.S. trip in the morning. As my earlier experience was nothing I necessarily wished to repeat we played it safe and went to my all time favorite. My lunch had been late and I wasn’t too hungry so I took the chance to try some of the small new dishes they had introduced. Starting with the ‘Tostaditas de Cangrejo‘ which were truly amazing. Big piles of sweet crab meat in a light creamy dressing. The avocado came hardly through but the chili splinters hit in nicely. Cold and spicy, a great dish. I wasn’t actually planning on having tacos again but then they had a new special one on the menu that changed my mind. The ‘Taco de Callo de Hacha‘ had some nicely pan charred fresh scallops with a great texture, pickled onions and grilled corn which gave it all an oddly interesting and crunchy texture. Nicely done guys, nicely done. Today my colleagues decided to go down to ‘Lucha Loco’, one of the few proper Mexican restaurants in Singapore, for some afterwork drinks and dinner. Unfortunately we didn’t have a booking on a very busy Friday which delayed our order by approximately one hour ish. 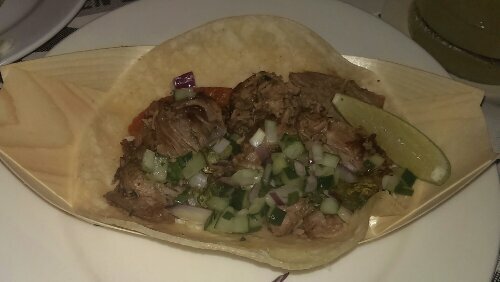 My first taco was my all time favorite the ‘Taco de Carnitas‘. The thick slice of pork belly is simmered nicely until juicy and tender and – I know I say that very often but – melted away in my mouth. To the soft pork they added crunchy ‘Jicama‘ or Mexican Turnip which added not only a different texture but also freshness to it. 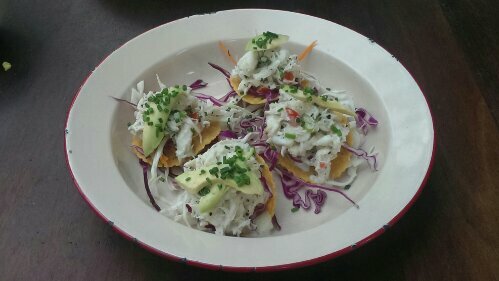 All this was finished with a drizzle of spicy cilantro mayonnaise and fresh lime juice. Delicious and still number one. 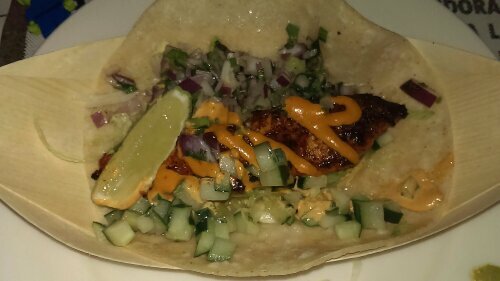 My second choice fell on one of their monthly specials, the ‘Baja Fish Taco‘. The fish was red snapper, fried in a thin but super crispy beer batter and still lovely moist on the inside. 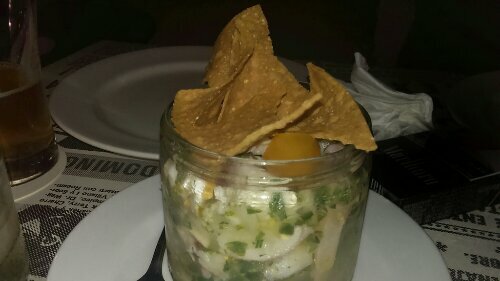 The salsa was mixed together of hot chilis, fresh mint and ripe and nicely sweet mango and worked just great with the fish. I then finished my three course taco sample menu with their ‘Taco de Chorizo Con Res‘. This one had a chunky mix of chorizo sausage and slow braised beef that tasted amazing and was heated up by some chopped red onions and a pretty fiery sauce. Finishing all these plus some sides I obviously wasn’t hungry anymore. Regardless I ordered the ‘Elotes‘, a Mexican style grilled corn cob which I always wanted to try. This was super good and filling too. It seemed that after grilling they dipped it into some spicy melted cheese and if this wasn’t enough, rolled the sticky cob in cotija cheese after. Goodness and so much better and spicier than I thought. I find the concept of this place simply brilliant; due to the busy bar area you get much more buzz than in your usual restaurant which makes it perfect to start a night our or to end a long week at work. The drinks are different, tasty and actually quite strong and the food on the menu is no other than delicious. It’s not the cheapest of places but well worth it I suppose. Great stuff.